Basic Handgun Safety / Concealed Carry Class - Pro Arms Inc. This class on basic handgun safety and operation is designed to meet the training requirements of the State of Florida for the issuance of a Florida Concealed Weapons License. 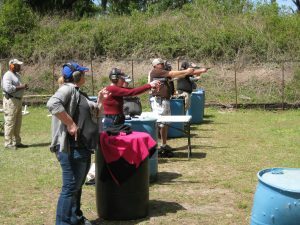 Instruction includes basic handgun safety rules, the safe operation and handling of both semi-auto pistols and revolvers and basic shooting techniques. We cover the importance of a proper stance, grip, sight alignment and trigger control. This course is essential for new shooters, as well a good refresher for shooters with previous experience, but who have not had any other formal instruction. Upon completion of the course, participants should have an excellent understanding of the importance of firearms safety, as well as have a solid foundation for continuing to practice the safe and effective use of a handgun. This course lasts approximately 3 hours and includes approximately 50 rounds of actual handgun shooting. Course fee: $50 per person if you use your own handgun and ammunition and $90 per person if you use guns and ammo provided by Pro Arms. Ask us about our multi-student discount if you bring other family members or friends. The number of students we can accommodate for each class is limited. Spaces are assigned in the order of participant registration. The class fee must be paid at the time of registration. Please be aware that you will be required to fire 50 rounds of live ammunition during this class. If your firearm or ammunition becomes unserviceable before completion of the live fire portion of the class, Pro Arms Inc. can provide either in order for you to complete the class. In this event, additional costs will be incurred by the student. Your certificate of completion will not be issued until the additional charges are settled. Cancellation prior to the Saturday one week prior to the class is refundable with receipt. Cancellation within 7 days (Saturday one week prior to) of the class is not eligible for a refund but will be rescheduled to another class. Failure to appear without notice will result in forfeiture of fee.